Moshe Dayan: Story of My Life. New York: William Morrow and Company, 1976. First edition of the Israeli military leader and politician’s autobiography. Octavo, original cloth, illustrated. 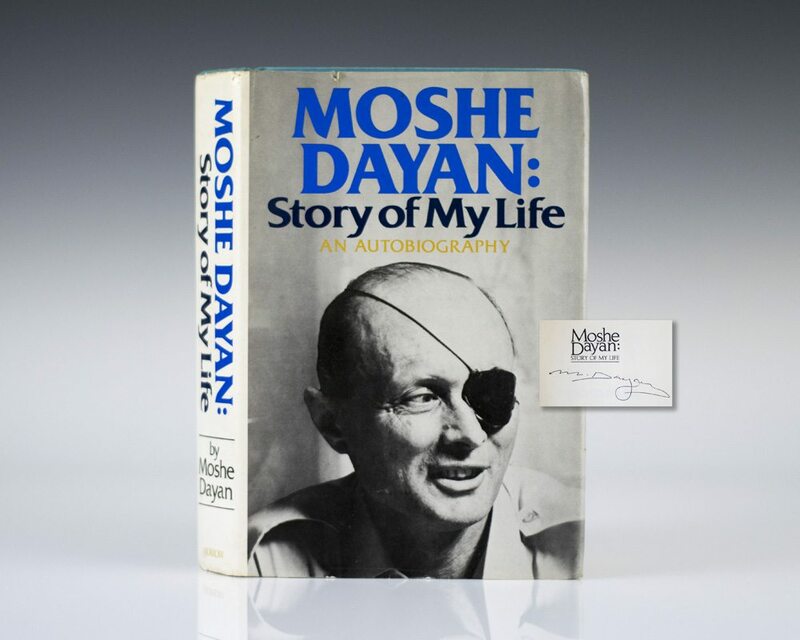 Signed by Moshe Dayan on the half-title page. Fine in a near fine dust jacket. "Moshe Dayan" is the autobiography of a soldier who never forgot his roots as a farmer, a loner who rose to the highest echelons of government. Here he describes his kibbutz childhood, his involvement in the Jewish underground, the battles he fought as the head of a commando unit in the War of Independence, his experiences as chief of staff and mastermind of the 1956 Sinai Campaign, and his tenure as Minister of Defence during the Six Day and Yom Kippur wars. One of the greatest generals in modern history, Dayan was also a man who hated the suffering that war brings, and who loved the land of Israel more than himself. He writes of his heroes, friends and enemies, providing candid portraits of Kissinger, Ben-Gurion, Golda Meir and other notables. This is a story of a brilliant soldier who grew up to be one of the most respected and heroic figures in the Middle East. New York: William Morrow and Company, 1978. First edition of Moshe Dayan’s Living With The Bible. Quarto, original cloth. Inscribed by Moshe Dayan on the half title page. Fine in a fine dust jacket. New York: Harper & Row, Publishers, 1966. First edition of this autobiographical work by Dayan. Octavo, original cloth, illustrated. Boldly signed by Moshe Dayan on the half-title page. Rare and desirable signed by Dayan.